Enjoying a fresh cup o’ joe in the morning is one of life’s simple joys. It may be mundane to some, but for coffee lovers, it is what completes their day. There are lots of kinds of coffee and different ways to prepare them. In this article, we’ll talk about how to prepare great coffee using a French press coffee maker. Using a French-press coffee maker will bring out the best flavor in your home-brewed coffee. For this, you will need fresh, roasted coffee beans and the right equipment to grind the beans and brew the grounds. All you need to make great coffee, inexpensive coffee in your own kitchen is a burr grinder and a French Press Coffee. A burr grinder will grind the beans between two discs with teeth. You can either use an electric or hand-cranked model, whichever you prefer. For the French Press, it is made up of two parts: one is the pot and a plunger that will separate the grounds from your brewed coffee. So here’s how to make it. Make sure you get decent beans. The thing is, asking one to name the best coffee beans is just like asking one to name the best wines. It is a highly subjective topic. But, there is one key component that separates the poor from the rich (so to speak) and that is freshness. Buying freshly roasted beans, as opposed to those packaged and stored for months at a time, is the best way to make your coffee experience more positive. So make sure to find a coffee shop nearby that roasts their own beans. If you can find one, then why not try roasting your own beans? It make take some time to master it, but the it will be very rewarding. Once you have the roasted beans, the next step is to grind the beans yourself. After you’ve bought high-quality, freshly-roasted beans, the next step is to keep them fresh. The best way to do this is to buy whole beans, store them in an airtight container and grind them just before brewing. It will help keep the flavor of the beans locked in until you’re ready to taste them. Lastly, you will need a French-press. 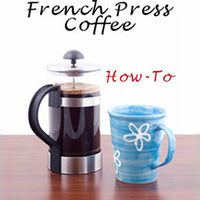 A French-press is also known as a press pot. It is a simple coffee making device that is said to have originated in France during the 1850s. It is normally a glass cylinder with a “plunger” like device that fits tightly into the circumference of the cylinder. The plunger will have a handle of some sort of wire or nylon mesh that will push the coffee grounds to the bottom, trapping them there after a few minutes of brewing. The reason why this less advanced coffee maker is much more appealing is because coffee made from French-press tastes better. That’s because The coffee grounds are fully steeped and saturated at the start of brewing and will retain the natural oils of the coffee that are normally absorbed by the paper filter. Now that you know how to prepare the coffee beans, it’s time to learn how to brew it using the French-press. Measure fresh filtered or spring water into a kettle and bring it to a boil. The amount of water will depend on the capacity of your French-press. Once it boils, turn off the heat and let the water sit for 30 to 60 seconds. This is called “off-boil.” Remember that bad-tasting water will affect the flavor of your brewed coffee and heavily chlorinated water may also not produce a favorable result. Grind the beans to a coarse ground using a burr grinder. Keep in mind that coffee grounds spend just a short time between the toothed discs before falling to the bin below. Make sure to clean the burr grinder bin regularly to remove stale coffee grounds that will ruin the taste of your next pot of coffee. After grinding the beans, place ground coffee in the French press pot and pour all the “off-boil” water on the grounds. Note that the usual measurement is 2 tablespoons for every 6 ounces (that’s 3/4 of a cup) of water. Put the plunger on the top of your French-press and set a timer for 4 minutes. If you want a bolder tasting coffee, you can leave it a little longer. In order to keep the coffee hot as you wait, use a kitchen towel and wrap it around the pot. Once that’s done, push the French press plunger down to the bottom of the pot. Pour off the coffee immediately after pressing down the plunger. It’s not ideal for your coffee to be in contact with the grounds after brewing. Enjoy the flavor of the first cup. Remember that coffee is a perishable beverage. If you want to refills ready and waiting, pour your fresh brew in a vacuum insulated coffee carafe. Fill the carafe with hot water before making your coffee and store it in a container heated up and ready to go. Empty out the hot water and pour in the freshly brewed coffee. Make sure to close up the top of the carafe tightly and you’re all set. How much caffeine in decaf coffee? How much caffeine in a cup of coffee? When is the best time to drink coffee? Is Coffee Good For You Or Bad For You? BestCoffeers.Com is a participant in the Amazon Services LLC Associates Program, an affiliate advertising program designed to provide a means for sites to earn advertising fees by advertising and linking to Amazon.com. Amazon, the Amazon logo, AmazonSupply, and the AmazonSupply logo are trademarks of Amazon.com, Inc. or its affiliates.